This morning was super fun! Room 7 had a enjoyable P.E session, it was challenging for some, but easy for others! The very first activity we did was our circle stretching! We stood in a circle looking a little exhausted but as soon as someone displayed a stretch we slightly woke up and continued to stretch! Vainikolo started the stretches, as usual and we all did the movements that we were acquired to do. After the the stretches were finished, we were assigned to do 3 laps around the netball courts, starting with the agile girls, followed by the rapid boys. I myself have been doing quite a few kilometers for my sport (Waka Ama) and it helps, as I came first! 3 laps around the courts was great. After our 3 laps, we sat and waited for approximately 2 minutes, thinking it was time to go back into class but no, Mrs Gray let us have extra fitness by having a relay session, the girls verses boys! Our first race was pleasant and I enjoyed it! Labels: P.E with Mrs Gray! Room 7 learnt about Earthquakes in Room 9, we learnt some basic information, then to move onto essential information, we also had an assignment/experiment on how to create a sturdy building using straws and other items so that it would be able to hold a 225 gram sand bag! Let's get onto the learning.. The remote structure of the Earth has many spherical layers, but in the very inside of the Earth lays a Mantle the center of the Earth! The mantle is made of metal, and is split into two apparent regions, the Inner Core which consists approximately 20% Ni and 80% Fe (Nickel and Iron). Next is the Outer Core which consists of liquid metal. What are the different ways the plates move? * Divergent Boundaries which separate from each other forming rift valleys or mid-oceanic ridges. * Convergent Boundaries are when the tectonic plates collide and move towards together. * Transform Boundaries happen when two plates grind past each other with neutral amount Divergent B and Convergent B (Boundaries). What happens when the plates move? When the plates move, there are 4 big impacts that the Earth has, the plates move and further forms oceans, mountains, continents. 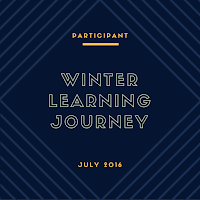 As you would all know by now, the Winter Learning Journey has just occurred and many students for different schools blogged about the activities provided in the Winter Learning Journey! For each activity blog, Rachel and her team would keep a count on how many points are in total! and to receive extra points, you would have to comment on others blogs and give some feedback! The Winter Learning Journey is an efficient way to keep your grades up and ready for the following term! Are you ready to see our finalists?! Here we go! Congratulations to first place, the most generous, amusing, resilient and wise young lady, Luisa! Also, congratulations to these two very entertaining, calm and bubbly ladies, Anita and Telesia. Now for a final congratulations to the funniest and weirdest person I've met, and most up straight and rebellious one, Cherise! 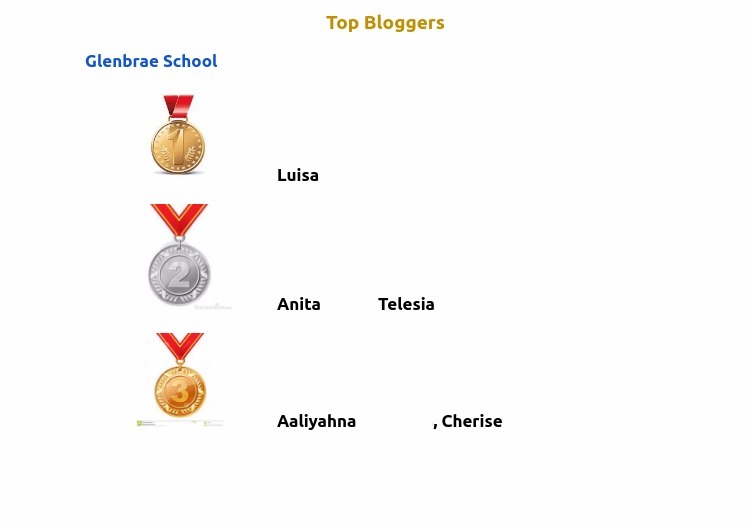 (I have blurred out the last names of these astonishing bloggers for Cyber Smart safety)! Thank you again Rachel and your team, for providing Glenbrae School, and not only Glenbrae, but many more schools with this stunning opportunity to participate in the Winter Learning Journey! We truly give our gratitude for this. Labels: Anita, Cherise, Luisa, Rachel, Telesia, Winter Learning Journey Congratulations! Today we have been learning about the three states of matter (solid, liquid and gas) and the changes of matter. In this experiment we first melted some chocolate in the microwave. This meant that the chocolate changed from a solid to a liquid. Then we piped it onto a piece of baking paper and further let it set. This meant that the chocolate changed back from a liquid to a solid. A few days ago, I learnt about the three states of matter which are Solids, Liquid and Gases!, and what the particles (molecules) do, the definition of chemical changes, what are atoms/learning the Periodic Table and many more! Liquid particles are together like a solid, but maneuvers around. (The bonds in the liquid is strong enough to keep the particles together, but also weak enough to let them flow together, kind of like a solid). Solid particles are intact and stays together! (The molecules in a solid vibrates, but do not move past together like a gas. The solids retains its shape or mould). Gas particles like to be separated! The molecules in gases move rapidly and past other molecules! The definition of "Chemical Changes" is when a substance is combined with another substance to create a new type of substance. A chemical change is irrevocable, which has to include the rearrangement of either atoms or, 'as mentioned above' when two or more substances are mixed to create a new substance. An example of a chemical change is wood being burned, ever so slightly that ashes start to form and parts of the wood will turn color (pitch black) and eventually burn, that is a chemical change, it cannot been turned to it's original form unlike a "Physical Change", which in this case can be turned back. Moving onto Atoms, What are Atoms, you might be dying to hear about?, well an atom is a “particle” that can only be seen using a machine (microscopic machine). An atom is also indivisible, which means, however many times you cut an object or thing etc, it cannot be divided! There is also 3 other things that are involved which are Protons, Neutrons and Electrons. What is a proton? A proton is a particle apart of Atoms, that is positively charged. What is a neutron? A Neutron is also another particle of atoms and in which are neutral. What is an electron? A electron is like a proton, accepts that they are both attracted to each other, but an electron has no electrical charge. 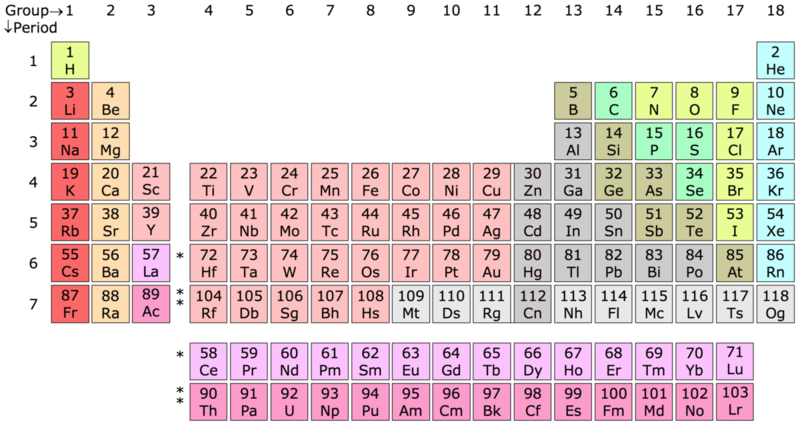 Above is the Periodic table! My adventure all around New Zealand was stunning, as well as, amusing to learn most of the characteristics/ features of New Zealand. On the first day I learnt some essential information about Kiwi's as a whole, where I would like to visit in New Zealand and how I could create a flag similar to our current one but a differnt one (Sorry if im so weird😂). My second day was different, I stayed in Dargaville and visited some landmarks. I also got to question Laura Dekker!! I learnt a lot about New Zealand, although I live in New Zealand, including Adopting a Red Crowned Kakariki and learning some facts about that specific bird, I also learnt about what occurs at the Farewell Spit and how the Whales are dying out, but some are being protected from our lovely New Zealanders. Another thing was creating a DLO on a famous New Zealander and I had to provide a few facts about them! Finally, I would like to make the biggest THANK YOU! to Rachel Williamson for creating the previous Winter Learning Journey and Summer Learning Journey and giving us an great learning experience! I have really enjoyed learning about New Zealand and sorry if I posted very last, I was just waiting for one picture😂, and I'm very sorry, but also Thankful for you Rachel! Have a safe rest of your holiday. 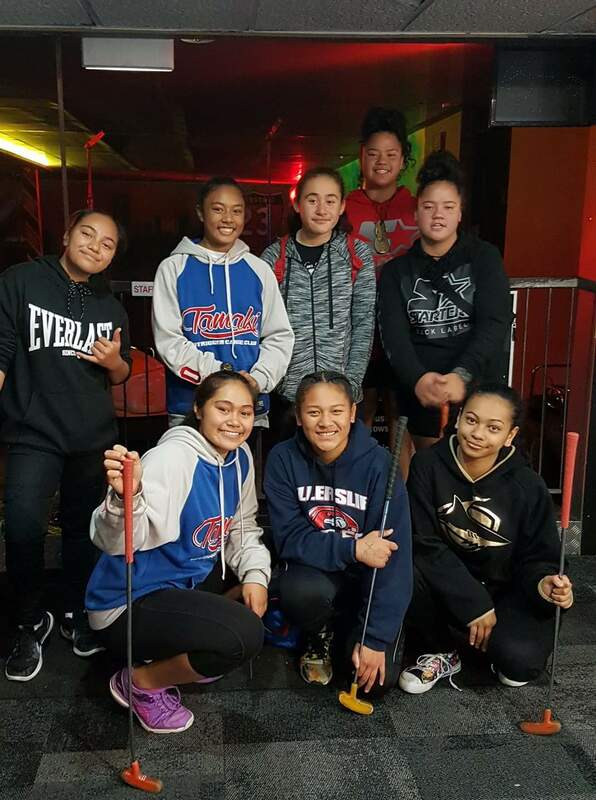 Activity 2: After you have finished up in Taupo, it is time to hop back in the car and head for Rotorua – a town where will have the chance for some much needed rest and relaxation. In fact, you will visit the Tarawera Bush Pool – a geothermal hot pool that is located in the middle of a forest. The warm water in the pool comes from underneath the ground. After a few hours in the pool you feel really relaxed. On your blog, post a picture of yourself doing something relaxing. I find reading really relaxing. Here is a picture of me reading one of my favourite books! Above is just an image of a bonding session with my Waka friends, today at Mega Zone! I love placing myself around people, like everyone! Doing something relaxing for me is BONDING!! But I also love studying, hitting the pools, and training! Usually I would say sleep, when I do, I eat extra, miss a lot and all the jazz. Dawn breaks on Day #7 – the final day of your Great Kiwi Road Trip. You wake up early, ready to make the long trek back to Auckland. Along the way, Curious Kiwi stops at two beautiful places, Taupo and Rotorua, for you to get out and walk around. Activity 1: While in Taupo, you go for a walk around the lake and you notice pieces of rubbish floating in the water. You also notice that there is rubbish on the footpath. As you know, it is really important to put rubbish in the bin and keep New Zealand clean and beautiful for generations to come. I would build an invention, one of a kind! It would be the smartest ideas of my life, and it will definitely benefit, despite the fact that I might attempt and fail and will take years to create. I would like to create a rubbish bin, no ordinary one but one the can detect rubbish and pick it up, but it will also identify the thrower and fine them! … Ok, jump back into reality! I would like to create posters, commercials etc to promote the awareness of Keeping New Zealand Clean! Posters can be anywhere, in your local supermarket, local hardware store and anywhere else. The commercials would be shown on Television all day and night to help spread the word! Finally, I would like to create a clean up team to organize a cleanup, which would occur every week, or two days!, anything that suits the time of the cleaners (of course I will be the cleaner). My personal favorite was.... "DRUM ROLL PLEASE"... #3. Rugby World Cup 2011- All Blacks vs France, because their was a lot of aggression that was performed and I like the newest version, but I also love #1. 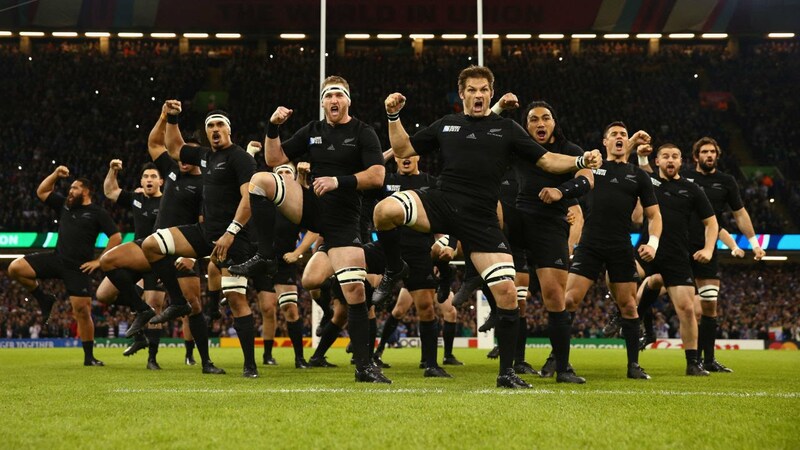 World Cup 2015 – All Blacks vs Argentina basically, what I am saying is... I LOVED THEM ALL! They were all so alluring and how a Haka is performed! 10/10 for all! At the end of your day at Te Papa, you head to your hotel in the centre of Wellington. You are staying on Cuba Street, one of the coolest streets in the city. Activity 2: After visiting Shag Point, you hop back in the van and drive all the way up the east coast of the south island until you reach the town of Picton. You get out of the van and onto the Interislander ferry. It travels back across the Cook Strait to Wellington. Wellington is the capital city of New Zealand and every winter the city hosts a huge Matariki festival to celebrate the Maori New Year. This year part of the festival is being held at Te Papa, a big museum in Wellington. Read about the Matariki festival at Te Papa. There are so many different things to see and do at the festival this year. On your blog, tell us about three of the events. You can choose any three events that you wish. Te Whare Mātoro: Haka fusion - Te Whare Mātoro: Haka fusion is mixture of traditional Kapa Haka dance moves that are fused together to create a fusion! Not only do the rangatahi (young people) use the Traditional Kapa Haka dance moves, they also use contemporary music and this blends together to create a Haka Fusion! Matariki Fireworks - Matariki Fireworks seems pretty self explanatory, but there are some extra essential information missing. Obviously Matariki is a mixture and celebration of diversity, and traditions to other cultures! I LOVE Matariki because of this. Held at Te Papa Promenade, Wellington, New Zealand, the fireworks are blasting!, that is done to commemorate Matariki, which also attracts audience! The Matariki Ritual - The Matariki Ritual is like a welcoming, you and your whanau are warmly invited to attend a Ritual! At this Ritual, they acknowledge the year that has just passed, as well as, offering appreciation, followed by story sharing stories, kai and rejoice in Matariki Rising together. Welcome to Day #6 of your journey and the last day in the south island. You are going to start the day by traveling 63 km north up State Highway 1 from Dunedin to a place called ‘Shag Point.’ Shag Point is one of five places in the south island where the Maori arrived hundreds of years ago to settle in New Zealand. They arrived at Shag Point in large canoes called ‘wakas.’ For more information on Shag Point and other Maori landing places, go to the Waka landing places website. in an anxious state, searching for a course. As I was timid, I was hoping for some hugs! Which no evils are pitch black! It would be an amazing opportunity to cycle the Otago Rail Trail! It would help my fitness level a bit, give me a chance to explore the exquisite scenery which lays there and give me another chance to see my mothers home town. A 150 km cycle trail seems challenging since the most I have ever ran (let's say paddle) is 18 km! It definitely sounds fun, but it wouldn't be as fun by myself, obviously I have to take my best friends and family! By the way, just looking at the image below⬇️looks alluring! Activity 2: After the adventure at The Lewis Pass Scenic Reserve, you are pretty happy to get back into the shuttle van and continue with your road trip. Over the next few hours you travel up and over the Southern Alps, arriving in the city of Christchurch to eat lunch. You have a delicious meal at a café downtown and then hop back into the van to travel to Twizel, a small town at the base of Aoraki-Mt Cook. Mt Cook is the largest mountain in New Zealand. It is also the mountain where Sir Edmund Hillary trained for his climb up Mt Everest – the tallest mountain in the world. Sir Edmund Hillary is very famous because he was the first person to ever reach the top of Mt Everest! Now it is your turn to learn about a famous New Zealander. Use Google to research one famous person from New Zealand and then create a DLO and post it on your blog. Be sure to include: 1. The name of the famous person, 2. Where they were born, 3. Why they are famous, and 4. Two other interesting facts about them. After a long day at the beach, it is now time to move away from the water and drive inland, through the middle of the south island. You are going to start in Nelson and drive south before crossing a huge mountain range called the ‘Southern Alps.’ The scenery is going to be amazing! Activity 1: After a few hours in the car, you, your group and Curious Kiwi arrive at your first stop – The Lewis Pass Scenic Reserve. It is a beautiful, regional park located at the base of the Southern Alps. You and your group get out of the van and follow Curious Kiwi. He is going to lead you on a short walk through the park. As you start walking, you notice a really cool looking tree on the side of the trail and you stop to take a closer look. When you turn back, the group (and Curious Kiwi) is nowhere to be found. Eek! You are all alone in the middle of a strange forest. After I was surrounded, in the bleak forest, searching for my crew and Curious Kiwi, I shuffled quite rapid, after seeing all the tree shadows, thinking I was being followed. I rushed so swiftly, that I dropped majority of my essential items, including my lollies! I saw so many creatures there, heard so many prodigious sounds and explored to the maximum of my desire, that I even forgot I had lost my crew and Curious Kiwi. I was devastated when I saw shades or orange, bumblebee (yellow) and bubblegum! I had realized it was morning and I hadn't seen my crew or Curious Kiwi, I thought of so many ideas to signal where I am but I got distracted with this amazing scenery. I searched and searched, but still nothing, until I started a fire which created smoke and could indicate where I could be. I waited, approximately, one full hour until the fire blew out, from the gusty winds, and decided to follow my trail I had left, before I ended up here. 20 minutes later, I found my delectable sweets and stress ate (basically, I ate the whole pack!). Suddenly I felt a grasp, just above my wrist and hastily looked behind in horror but ease. "Boo", screamed my crew and Curious Kiwi, while wearing pigmented black horror masks! I was so scared, I broke out by plunging my fists together and preparing to punch, until Curious Kiwi, shouted "It's us and we pranked you", I was confused then, but further realized why I had seen shadows, but I didn't get why wait until the sun was here. "This story, shall not be told, ANYWHERE!" I firmly told my crew and Curious Kiwi, while we laughed immensely and started walking towards our tour bus. Yes, fishing there should be banned, they know that that area is confined and a really alluring place for most sea life to go there!! Fishermen should be aware about their surroundings and care for the sea life which lay in those areas, especially if they are rare! So I would say, put an end to fishing in the Farewell Spit. I have many logic's, to support my statement, above! Including the population would be decreasing, there will be peace, (well no quite, but a little) between both argument sides and this is another definition of Animal Cruelty, expect in different concepts!